This is one of those easy to put together, simple stir-fries which has a minimum of ingredients but a maximum of flavor that make it perfect for a quick dinner after work. While this is an original recipe, I didn’t come up with the idea myself; I based it on a dish I had at China Fortune here in Athens the other week. Their version had tiny cubes of chicken breast and thigh, coated in cornstarch and deep fried until crispy. Then, they were stir fried with scallion, garlic, ginger and chilies with a thick, dark brown sauce. 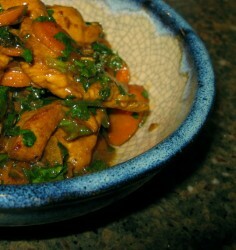 At the end, a large amount of roughly chopped cilantro leaves and stems were added, and stir fried until they wilted. The main flavors are the cilantro, garlic and chilies, and I wanted to do a version that was similar, but with a lighter, less thick sauce, and without the extra step and added fat of deep-frying. I also wanted to add a vegetable so that I could get away with serving it after work without having to go through the added effort of making a second vegetable dish. And since everyone in our household loves carrots, and their brilliant orange color would go beautifully with the green cilantro, they seemed like a natural choice. Of course, you could add a different vegetable, or entirely leave out the vegetation, with the exception of the cilantro and aromatics. So, without further blather, he is another simple Chinese stir fry, from my kitchen to yours. Toss together the chicken, wine, soy sauce and cornstarch and allow to marinate for at least twenty minutes, but no more than an hour and a half. Heat wok on the highest heat your stove can produce until a thin wisp of smoke rises from the bottom. Drizzle oil into the wok, and allow to heat for about thirty seconds or so, or just until the oil shimmers in the bottom of the wok. Add ginger and stir fry for about a minute. Add chilies, garlic and scallions and stir fry for thirty seconds. Spread chicken in a single layer over the bottom of the wok, and allow to sit undisturbed for about a minute. While chicken is browning on the bottom, sprinkle with the sugar and salt. When chicken has browned a bit, stir fry until almost all of the pink is gone from the chicken. You will see that browned bits of marinade have begun to stick to the sides of the wok. Drizzle the wine around the sides of the wok, and deglaze, scraping up the browned bits. Toss in the carrots, and continue stir frying until all of the pink is gone from the chicken. Add soy sauce, cilantro and scallion tops, and stir fry for about one minute more. I like that stuff too. Sandy made it for me and it is cilantro I can actually stand to eat that does not taste like soap to me. I’d need some shrooms, but other than that it sound really good. Someday I’ll find a source for unsalted Shao Hsing! Mmmmm… you are describing one of my all-time favourites. 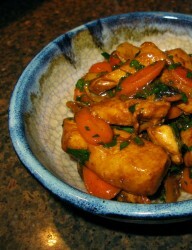 We make a chilli chicken that is not unsimilar to this. We use green onions if we have them, but find it’s just as good with regular onion. We haven’t added coriander leaf though, except occasionally as a garnish. What a great idea to stir them until they are wilted! The last time we had chilli chicken (which was just last week), we served it with stir fried green beans in fermented black bean sauce. Barbara, tonight I googled “cilantro and chicken” and halfway down the page found this recipe. As luck would have it I had nearly all the ingredients (had to substitute on the wine and leeks for the spring onions) and so I gave it a try – and we LOVED it! Thanks!! We had this last night and loved it. I am going to make it again tonight because we are fighting over the tiny scrap leftover for lunch. This is about the 4th or 5th recipe of yours I have tried Barbara. I am trying to go back now and leave my raving positive comments on each post. You’ve gotten a name in our house now and I even signed up for Salaam’s weekly specials, even though I live in Rome Italy! Lizah–thank you so much for your glowing response to this recipe. I made it for dinner myself last Saturday night for a friend who had not eaten it before and he was similarly effusive in his praise. The emails from Salaam should be interesting over the next few months as they will include not only weekly specials, but photographs of the development of the new location. I loved the cilantro chicken at China Fortune! I haven’t lived in Athens for a few years now and no Chinese restaurant in Columbus serves this dish. Now I can create it at home. Thanks for the grat recipe.